I measured the Solarises using a G.R.A.S. Model 43AG ear/cheek simulator/RA0402 ear simulator, a Clio 10 FW audio analyzer, a laptop computer running TrueRTA software with an M-Audio MobilePre USB audio interface, and a Musical Fidelity V-CAN amp. On the Model 43AG, I used the new KB5000 and KB5001 anthropomorphic simulated pinnae for most measurements, and the stainless-steel coupler included with the RA0045 for certain other measurements as noted. These are “flat” measurements; no diffuse-field or free-field compensation curve was employed. 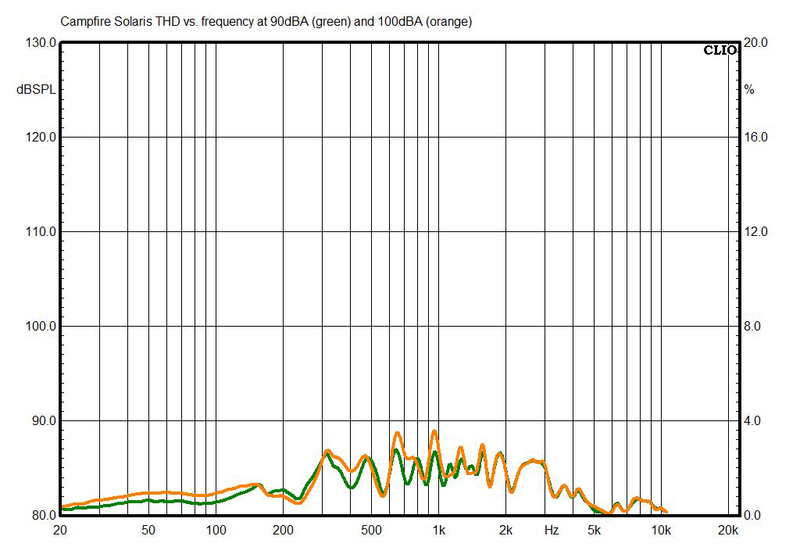 The above chart shows the Solarises’ frequency response measured with the KB5000 and KB5001 anthropomorphic simulated pinnae. This is pretty standard response for earphones, except that they have less bass and treble response (or more midrange response) than we usually see. The measurement here was done with medium-size Campfire Marshmallow foam tips. I also tried using the supplied medium-size silicone tips, and the result was almost identical. 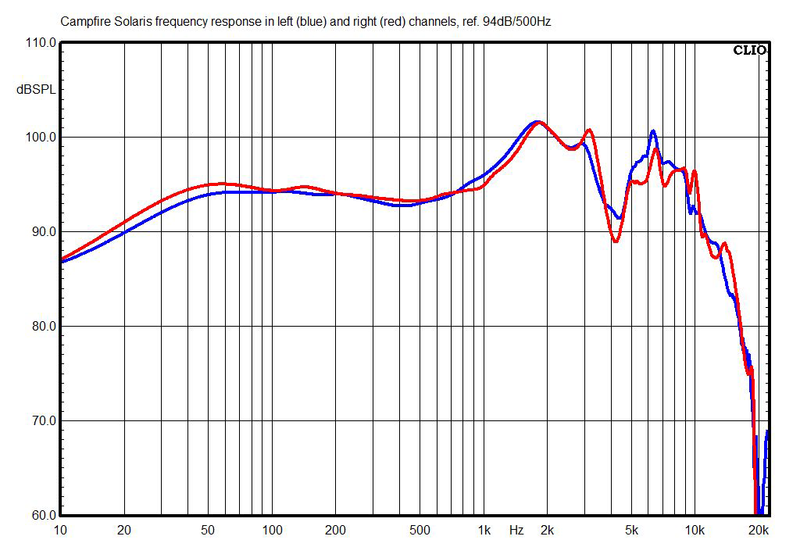 This chart shows the Solarises’ right-channel frequency response measured with the RA0045 ear simulator’s stainless-steel coupler (which I’ve used for years) and the new KB5000 simulated pinna, which I recently switched to because it more accurately reflects the structure and pliability of the human ear and provides a more realistic simulacrum of what you’ll actually experience with headphones or earphones. This is just for sake of comparison with older measurements of mine. Here you can see how the Solarises’ tonal balance changes when they’re used with a high-impedance source, such as a cheap laptop or some cheap professional headphone amps. 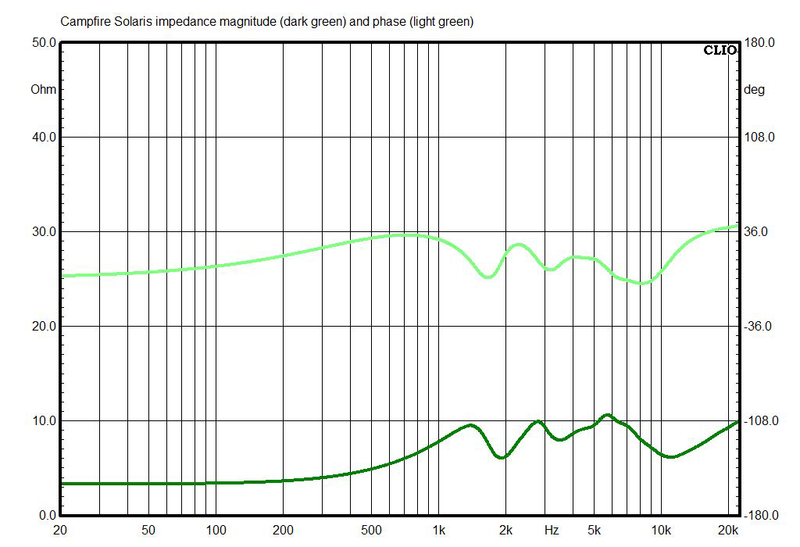 As usual with earphones incorporating balanced armature drivers, there’s a tonal balance shift when you go from a low-impedance source device (typically between 0.5 and 5 ohms) to a relatively high-impedance source device (typically 75 to 125 ohms). 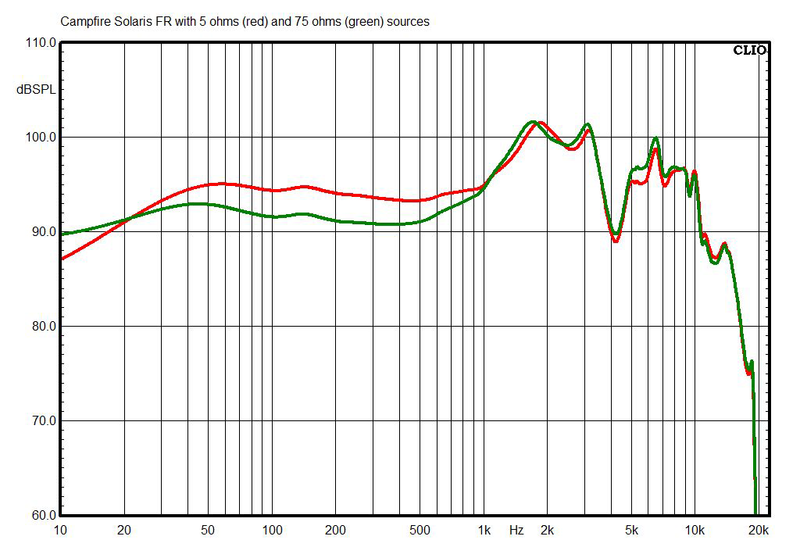 In this case, the bass and lower midrange will be attenuated by 2 to 4dB relative to the treble. Note that this measurement is normalized to 1kHz; it would probably be more accurate to say the treble output from the balanced armatures is boosted by 2 to 4dB and the bass from the dynamic driver stays about the same. 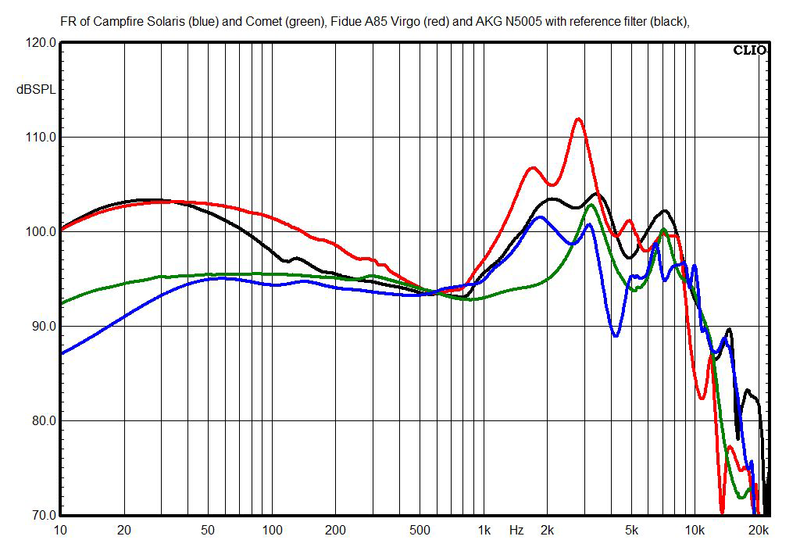 This chart shows the Solarises’ right-channel response compared with a few other midpriced earphones: the Fidue A85 Virgos, Campfire’s own Comet earphones (which cost less than one-seventh as much, but I was curious to see if there was a family resemblance), and the AKG N5005s, the earphones that currently best conform to the “Harman curve,” shown in research by Harman International to be the preferred in-ear headphone response for most listeners. The Solarises’ response does look similar to the other brands, just flatter. 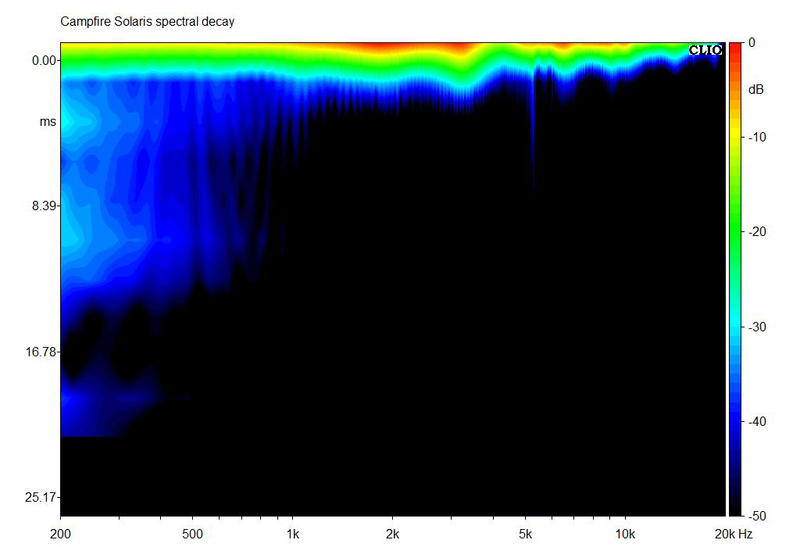 The Solarises’ spectral decay (waterfall) chart shows no significant resonance at any frequency within the range of this measurement (i.e., above 200Hz). 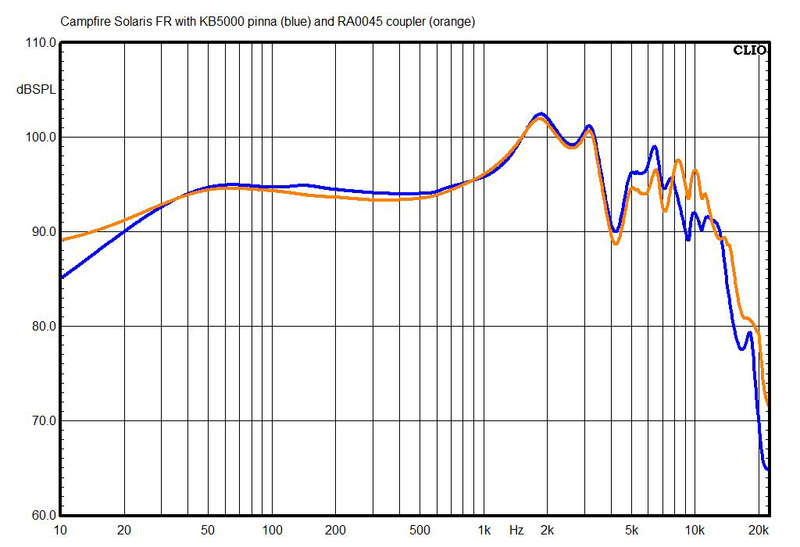 The Solarises show a little more distortion than I’m used to seeing in high-end earphones, and the distortion seems to be coming mostly from the midrange driver; it’s about 1 to 2% at the fairly loud level of 90dBA, and a little above that at 100dBA. That may seem like a lot of distortion if you’re used to looking at amplifier distortion numbers, but in speakers, headphones, and earphones, this level is barely, if at all, audible. In this chart, the external noise level is 85dB SPL, and numbers below that indicate the degree of attenuation of outside sounds. The Solarises’ isolation is maybe a hair better than average for large earphones, although a small earphone such as the Campfire Comet (also shown here) may achieve somewhat better isolation because it can go a little deeper into the ear. 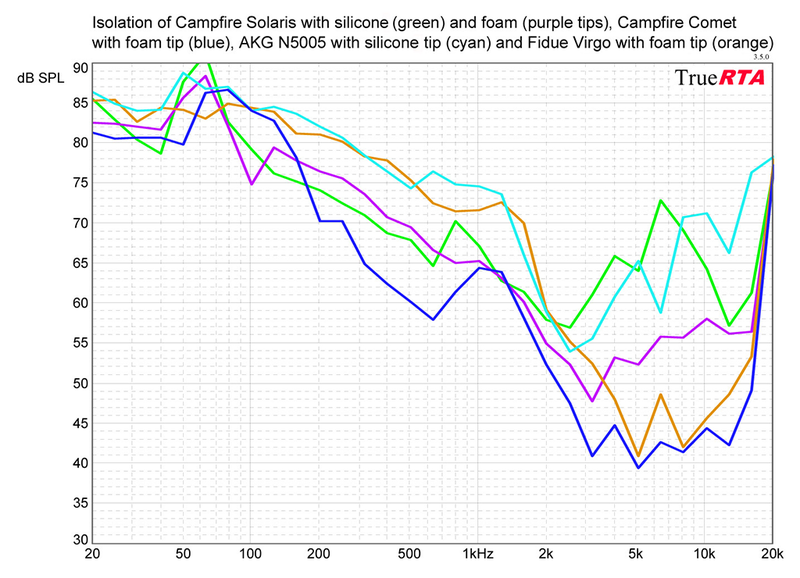 The Solarises’ impedance response is very low in the bass, at about 3 ohms. Once the balanced armatures kick in, it rises to 7 to 11 ohms, and the phase shifts positive. This is why the tonal balance changes with high-impedance source devices. Sensitivity of the Solarises, measured between 300Hz and 3kHz using a 1mW signal calculated for 10 ohms impedance is 115.7dB, which is very high for high-end earphones.